A relatively small engagement that had major media, political, and policy implications, the Battle of Ap Bac took place between Viet Cong (VC) and Army of the Republic of Viet Nam (ARVN) forces on January 2, 1963. It took place in an area of the Mekong Delta that had been dominated by VC guerrillas. The ARVN were decisively defeated. Vann was quite public about the problems that led to the defeat: "There were three main criticisms .... First, the failure of South Force to move. Second, failure of the APC's to move. Third, the parachute force. They were dropped on the wrong side of the river. It was a decision that I opposed. They wanted to reinforce defeat rather than ensure victory." While there were indeed failures, he also did not fully understand the motivation of some competent junior soldiers. In a politicized military, there were reasons for officers, at many levels, to be risk-averse. It may not have been the ideal from a U.S. standpoint, but it is the sort of lesson that needs to be learned in multinational operations. Unity of command is a basic military principle, but both politics and technical skill prevented it. The South Vietnamese cavalry, CPT Ly Tong Ba, commander was also the political leader of the province, not in the ARVN chain of command. His chain of command expected his keeping casualties in the Civil Guard and armored cavalry to a minimum. Not only were there strains between the U.S. advisors and the ARVN units they advised, but the advisors did not have authority over other supporting U.S. units, such as the helicopters that transported the ARVN soldiers. While the senior Vietnamese officer, the commander of the 7th division, and his American advisor, Vann, had a good relationship, there was still no overall commander. Even Cao did not have authority over the province chief. U.S. command relationships were not ideal. While GEN Paul Harkins was the senior American officer, commanding Military Assistance Command, Vietnam, the earlier Military Assistance Advisory Group (MAAG-V) still existed and technically controlled advisors like Vann. MG Charles Timmes commanded MAAG-V, although he was also a deputy to Harkins. Timmes did have a command relationship to Vann, through the corps advisor, COL Daniel Boone Porter. Communist guerrilla forces needed to be of fair size before they had a radio transmitter, and that it stayed in one place suggested some level of strength. Nevertheless, Vietnamese Army intelligence had reported a reinforced Viet Cong company in Tan Thoi, 1,500 meters northwest of Ap Bac. Following Joint General Staff orders of December 28, the ARVN 7th Division, planned an operation to trap the Viet Cong, by landing the 11th ARVN Infantry Regiment to the north by helicopter while a provisional regiment of two battalion-size task forces of Civil Guards (later named Regional Forces) moved in from the south. Civil Guards reported through the province chiefs, and were not in the military chain of command; coordination could be hit or miss. A unit of M113 armored personnel carriers, the 4th Mechanized Rifle Squadron, 2d Armored Cavalry, commanded by Captain Ly Tong Ba, was attached to the provisional regiment and was to attack from the southwest. Two American advisors were with the M113 unit. Three Vietnamese Ranger and infantry companies were in reserve, with artillery and air support on call. Intelligence estimates of enemy strength were wrong. The Viet Cong were actually actually actually the 261st Main Force Battalion, supported with additional machine guns, mortars, and several local guerrilla units. 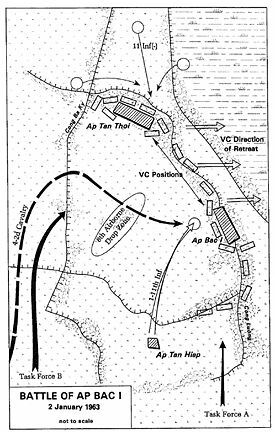 As the mobile forces moved toward the area, the Civil Guard had made contact, but their commander, Dinh Tuong province chief MAJ Lam Quang Tho, had not informed Dam of the contact until it was almost over, and then, not sending in his own reserves, asked Dam to airland the division reserve companies and outflank the VC fighting his men. He did not realize that the proposed landing zone, at Bac, was the prepared fighting area for the rest of the VC. Vann, in a light aircraft, thought Bac was a logical assembly area, but could see nothing specific from the air. He gave the leader of the U.S. helicopter unit, carrying the ARVN reserve, an approach that he thought would keep the helicopters out of range of any VC antiaircraft. That helicopter unit, however, was not under his direct authority, and he was distrusted by aviators that thought he tried to give them orders in their area of expertise. The VC knew the helicopter radio frequency and prepared fr them, opening fire as they were on final approach. The ARVN lieutenant commanding the landing force froze, but an American sergeant with him was able to rally the soldiers; after several helicopters were shot down and Sergeant First Class Arnold Bowers was able to rescue survivors, the lieutenant reasserted himself. When Bowers asked for the single radio, to call in air strikes against the VC. Another ARVN lieutenant, a forward observer with the only other radio, also was ineffective. Vann, seeing the situation from the air, called for the M113s to move into the area, but the American advisors told Vann that Ba would not move, saying "I don't take orders fro Americans". Ba did have a challenging situation, in that the far side of the canal did not offer a good crossing point near his position. Capt. James Scanlon, one of the advisors, was surprised, as Ba had been aggressive in the past. Ba's perspective had changed, however, due to South Vietnamese politics. President Diem, as a safeguard against their use in a coup, had taken the M113 units out from Dam's control, and put them under the province chief, Tho. Ba would not move without approval from Tho. Vann's impression of the battle was not universally shared. The press generally accepted his stories, most of which had a core of truth, with the least question. On January 3, the day after the actual battle, several U.S. reporters, including Neil Sheehan and David Halberstam, General Paul Harkins to ask what he thought about the battle just fought at a place called Bac. Harkins had just been briefed by Cao, and, while knowing the battle was already over, said "we’ve got them in a trap and we’re going to spring it in half an hour." Halberstam first learned that attacking across a rice paddy is much more difficult than it seems. Later in 1967, Neil Sheehan observed that U.S. forces found this sufficiently difficult that they would call in artillery or air rather than try to cross. Roger Hilsman "contained some mistakes, but it was not nearly the botched up disaster that the press made it to be. George Ball despised Hilsman and later took pride in firing him. Had he been able to understand what a complicated man he was dealing with and what grief Vann was to cause him, Harkins undoubtedly would have fired Vann, let Porter go into the bargain, and accepted crucifixion by the news media in the future. Vann had no intention of behaving himself in the future. Vann's direct supervisor, COL Daniel Boon Porter, wrote that Harkins and United States Central Command commander were quite aware of the constraints under which the action was fought. Diem rated the Central Highlands as the most strategically important area in Vietnam and the Mekong Delta the last. It was neither in a critical transportation route, nor densely populated enough for efficient pacification. This page was last modified 22:27, 4 July 2010.